Earning a high score on the Law School Admission Test (LSAT) is the first thing you need to do to set yourself on the path to get into your dream law school. The free Varsity Tutors LSAT Prep app for iPhone, iPad, and Android devices is a resource that may help boost your score. It's helpful to know the two things that admissions committees are considering when they see your score. The first is that the LSAT is the best tool to determine your future success as a law student. The second is that the school’s incoming LSAT scores are one of the methods used to evaluate the law school. Schools want to be able to boast about the LSAT scores of the students they accept. Is there vocabulary in some law passages that you could use a little help defining? Are you able to both strengthen arguments and weaken them effectively? The LSAT app offers tools to assist you in testing your knowledge on these concepts, as well as learning any other concepts you don’t already know. You can test yourself on logical reasoning, logic games, and reading comprehension with the extensive library of flashcards on the app. You can also make your own flashcards using text, images, and audio to enhance your learning experience with the built-in Flashcard Maker. As you begin your studies, you will first look at Logic Games. These can be tricky, as there is not a specific course that covers these in a typical school curriculum. Logic games require a certain type of thinking that does not come naturally to everyone. For example, you may be asked to figure out the order in which a set of portraits are hung The app provides plenty of practice in logic games. Each question includes detailed descriptions of the answers, leading you into thinking through logic games in a, well, very logical sort of way. Then, you will focus on the Logical Reasoning section, which might be more familiar to students, as it has questions on the types of logic that most students learn in schools. You will focus on assumptions, finding flaws in logic, and making inferences to determine whether something can or cannot be true. In addition, you are tested on important skills a law student should have, such as how to strengthen or undermine an argument. Finally, the app’s concept-specific practice tests for Reading Comprehension, the largest section on the test, will help prepare you for understanding passages in law, the social sciences, science, and the humanities. You can save your past scores to track your progress toward earning that perfect 180. The full-length, timed practice tests can be used to identify your strengths and weaknesses. Afterward, you can use the Learn by Concept section to work on any areas you need help with. 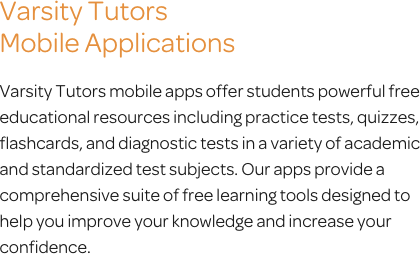 Varsity Tutors’ free iOS or Android app for LSAT Prep works for even the busiest of students. Download it today, so you can use all the features on whichever device you carry with you. With this app, you have a consistent, convenient way to enhance your skills so you can score your highest on the LSAT. Commonly known as the LSAT, the Law School Admission Test is a standardized test that assesses your aptitude for the rigors of law school. The LSAT is taken by over 100,000 prospective law students each year. It is a requirement for admission to a Juris Doctor program at law schools throughout the United States, Canada, and Australia, and is considered by selected law schools in other countries as well. The test is administered by the Law School Admission Council, and was first given in 1948. The LSAT is intended for students who have either already earned a bachelor’s degree, or undergraduate students who are about to graduate. The test measures your abilities in reading comprehension, verbal reasoning, and logic. The LSAT is made up of five multiple-choice sections and one writing section. The multiple-choice sections include one Analytical Reasoning section, one Reading Comprehension section, and two Logical Reasoning sections. There is also an unscored variable (or experimental) section. The writing section is also unscored; however, it is scanned and included in the scoring reports provided to law schools. Excluding breaks, you will have three-and-a-half hours to complete the entire exam. Your performance on the test is seen as an indicator of your potential success as a law student, and law school rankings are calculated by the LSAT scores of the J.D. candidates they accept. The LSAT is scored on a scale from 120 to 180. You can take the test no more than three times over the course of two years. Each of your scores earned within the past five years are reported to the law schools to which you apply. The average of all of your recorded scores is reported as well. The multiple-choice sections may be given in any order, and the variable section will not be identified. You will have 35 minutes to complete each of the six sections of the LSAT. The Reading Comprehension section contains three medium-format passages that may be on a variety of topics, including the physical and social sciences, arts and humanities, and law. You will also face a set of comparative reading questions. These are based on two shorter passages with opposing points of view. Each of the three longer passages and the comparative reading passages present you with a set of five to eight questions to answer. In total, you will face between 26 and 28 questions in this section. You will need to be able to recognize main ideas and important details, understand the significance of context in vocabulary and phrasing, and evaluate the effects that new information has on an argument’s strength or weakness. You will also need to hone your inference-making skills. Based on the information given in the passage, you will need to decide whether or not a statement can or cannot be true. You will be asked to make inferences about an author’s opinion and beliefs, as well as the opinions and beliefs of others. The Analytical Reasoning section of the LSAT is commonly referred to as the “logic games” section. It is generally regarded by students as the section that requires the most intensive preparation. Each section consists of four “games.” In an effort to remain accessible to a wide range of students, the topics covered by the questions will not necessarily be related to law. They will ask you to exercise a variety of skills, including grouping, ordering, and matching elements. Other games involve working with a number of variables. There are between 22 and 24 questions in this section. The Analytical Reasoning section will assess your competency in using the information from a set of facts and rules to determine what may or must be true. The skills evaluated by this section are similar to those you would use to determine what may or must be true from the terms of a contract, a set of regulations, or the facts of a legal case. You should be prepared to use your deductive reasoning skills to evaluate the relationships of people, places, items, or events. Though this section can sometimes seem intimidating, the LSAC notes that successful performance on this section does not require any formal education in logic. The LSAT also contains two Logical Reasoning sections. These are intended to measure your abilities in the analysis and dissection of arguments. Each of the Logical Reasoning sections contain 24 to 26 questions, which begin with a brief argument or set of facts. With this information, you may be asked to determine which answer best expresses an argument’s main idea, or point at issue. You should also be prepared to identify methods of reasoning and instances of parallel reasoning. This section is designed to measure your skills in analysis, critical evaluation, and argument completion. You will need to have a keen understanding of logical reasoning concepts like assumption, premise, and conclusion. The questions are written in ordinary language, and they test fundamental skills in reasoning, like identifying flaws in an argument, analyzing the effects of additional information on an argument, recognizing and analyzing differences and similarities in reasoning patterns, and drawing informed and supported conclusions. The five multiple-choice sections of the LSAT also include a variable section. This section is unscored, and is not reported as a part of your final score. This experimental section is used to test questions that may be used on future editions of the exam. You will not be told which of the multiple-choice sections is the variable section. Finally, you will face the LSAT’s writing section. You will receive a prompt that presents you with a problem and two decision options. You will then write an essay that favors one of those options. There is no “correct” answer to the writing prompt; rather, it is most important that you form a strong and well-supported argument for the option you have chosen, and against the opposing option. Though unscored, approximately 94 percent of law schools use the writing section as a factor in admissions decisions. Since the LSAT is such an important part of the J.D. program admission process, it’s important for you to engage in comprehensive, regular preparation. Ensuring your reading comprehension, verbal reasoning, and logic skills are strong is the best way for you to feel confident as you approach test day.